Last Wednesday, I semi-spontaneously decided to go on a tour. ‘Semi-spontaneously?’ some may wonder. Usually I plan for a week or more. This time, Jens announced on Tuesday that he would work from home Thursday and Friday. The thought to have Jens drop me off Wednesday night somewhere to camp for an early Thursday start popped into my head. Jens would be home for 4 days meaning I could leave Loke at home. It didn’t happen that way. The days slipped away and somehow, the trip got pushed to Saturday AND Loke was to come with me. At least the weather was supposed to be nice! A bit on the cooler side and sun/cloud mix. As for my route, that was the easiest part! I had already planned 120 miles (give or take) for the last one. I’d just start where I stopped last time. No need to reprint the maps! It was a bit cool as we piled into the car for the drive to Surahammar. I enjoyed the views as we went. The play of cloud and shadow on ripening wheat and canola fields set against the clusters of woods made for a pretty display. Roughly an hour later, we arrived at Stenhuset in Surahammar. The first thing I did was made a bee-line for the bathroom/outhouse as Mother Nature was making her presence known. Annoyingly, it was locked. That worried me some. Suffering a repeat of the last tour where I spent 90% of the time in desperate need of a bathroom or secluded clump of bushes where I could get my trike off the road was not in my plans. As I unloaded everything, I knew I was going to double back the half mile or so to the little outhouse by the canal lock. Misgivings weighed heavy on me while harnessing Loke. He seemed excited, but lacked something of his usual zeal. The weather had also shifted slightly. The forecast had called for partly cloudy and winds nearly calm. Ideal touring weather really. The clouds had thickened though not threatening. The weather forecast software was way, WAY off on the wind. It blew through the trees, setting the leaves and limbs into a swaying dance against the cloud covered sky. It was on the cold side of brisk too! I tend to be more sensitive to heat and less so to cold, so when I was considering my windbreaker, Jens remarked he knew it really was cold and not just him. We had a brief complication with Loke’s gear when I found I’d forgotten the green leash I tether to his collar to help control him if he gets a bit crazy upon seeing other dogs or small critters. Jens offered a neon green bungie leash used when skijoring with the fuzzy one. It was a couple meters long, but I wrapped it around various places until it was the right length. I didn’t even have to hold on to it though I could grab it quickly in an emergency. After saying farewell to Jens, Loke was ready to bolt and I let him go, with a few slow downs to cross streets and whip around curves on a cycle path. Less than 5 minutes later, I was back at the site of the canal lock where I’d discovered I was unable to pitch camp. I would have had another frustration to the ‘thunderstorm mud-ride’ if I’d tried it again. The center of the bridge across the lock channel had been dismantled. Not sure if it was to repair the bridge or to repair the smaller lock under it. Either way, it was impassible. Quick trip to the smelly outhouse and we were back on our way. Loke seemed a little irritated by the need to run over ground we’d crossed just minutes earlier. At least it was for less than a mile. Navigating the way out of Surahammar gave me a few wrong turns thanks to the road names obscuring map view on my little screen. I puzzled it out and we pedaled out of town, passing some sort of motorcycle rally being held at a small motorcycle museum. Loke and I caused quite a stir with many big smiles and waves. The fringes of Surahammar disappeared in my little mirror as I took Olbergavägen south. It’s a small country road that roughly follows the Stromsholm canal. Motorcyclists must love it! Or even car drivers. It’s not designed for speed mind you, lacking a center line and being just wide enough for 2 cars to pass, but the curves! With a 70 kph speed limit, I’m sure it would have been a blast. Loke was running warm as we went, but his speed was good at around 8.5 mph. Me, I was a tiny bit on the chilly side, but it felt pleasant. As the clouds broke here and there, the wind was a welcome counter to the strong August sun though the fuzzy one would likely disagree. Pulling the trailer along certainly felt much easier than the previous time. Frequent checks of the running bar tether and the musical jingle of the clip on harness ring told me Loke wasn’t pulling much either. It was mostly me. Helping or not, I felt much happier with the furball at my side. Around mile 4, I passed something that made me grin. I also had a small pang of envy for the lucky children who’s parents had built them an awesome looking tree house. It had three stories! Okay, well two stories with a third floor lookout point. The rooms of the first two floors were quite small, perhaps just large enough for a kid to lay down in, but the bridges to the upper deck were amazing. Yep, bridges! Two of them in fact. One reaching out and slightly up to a neighboring tree and the second one back and slightly up to the lookout post. They were sturdy and railed yet I could imagine a parent in the US trying to build something like that for their kids only to have child services called to haul the tykes away on endangerment charges. I didn’t have a tree house as a kid, but I did have a massive old oak tree that I swung through like a spider monkey and walked the wider branches with all the confidence of a gymnast on a balance beam. Those bridges were probably far safer than swaying oak limbs. The road straightened a little and soon ran right along the river itself. The slow water with it’s dark mirror surface lapped barely two yards away from Loke with just a metal guard rail and steep 4′ drop between. Trees and undergrowth crowded that narrow strip between water and road, giving the bank a secret feeling in the dim shadows. The furry one was intrigued by it. Intrigue turned to excitement after the passing of a large pleasure boat. The wake washing and splashing so close made Loke want to leap down and catch the wavelets. After a mile or more of railing and trees with water tantalizingly close, I wished for a spot I could pull over and let Loke poddle around in the river. Someone was listening. Less than 5 min after muttering the wish, there was an opening in the railing. Not much space to pull the trike over, but trees had been cleared for about 10+ meter strip to either side and a gravel bottom had a moderate slope. It wouldn’t surprise me if that gravel had been laid down given the abrupt nature of most river beds in this area of Sweden – 1 yard from the bank and it’s 10 feet deep. I leashed and freed him from the trike tether and Loke gave a joyous bounce to the water’s edge and… stopped to carefully feel his way forward until standing in about 8 inches or so. He’s learned his lesson from the rude dunkings he’s had in the past. I sat uncomfortably on a tree root and ate a Wasa cracker type thing. Swedish hard bread with a cream cheese and chive filling. It’s about the only time I eat hard bread. Surprisingly, Loke continued his water sports rather than coming over to drool and beg for a bite. Just down the road a bit, I could see what appeared to be a bridge/building combo that spanned the river. After Loke let me know he was bored, we headed in that direction. The road continued on toward Hallstahammar, but a paved turn headed for the bridge with a sign indicating the Stromsholms Canal bike path. Intrigued, I decided to take a look. It actually turned out to be a little nerve-wracking. The way across led over the top of old stone pylons with flood gates between them. In the spaces between the pylons, was wood decking. The fit was quite narrow. Barely enough room for the trike and Loke at the same time. The other side was blocked by a chainlink fence to keep people out of the flood gate control area I think. Adding to my dislike of the crossing was the chicken wire laid down over the wooden section. I saw wires sticking up and in a few places the nails pinning the wire in place weren’t very well flattened. Images of using multiple patches on each of my five tubes (3 trike, 2 trailer) danced through my head. I still stopped for a picture of the downstream side. The other side made the harrowing, wire and nail studded crossing worth it. 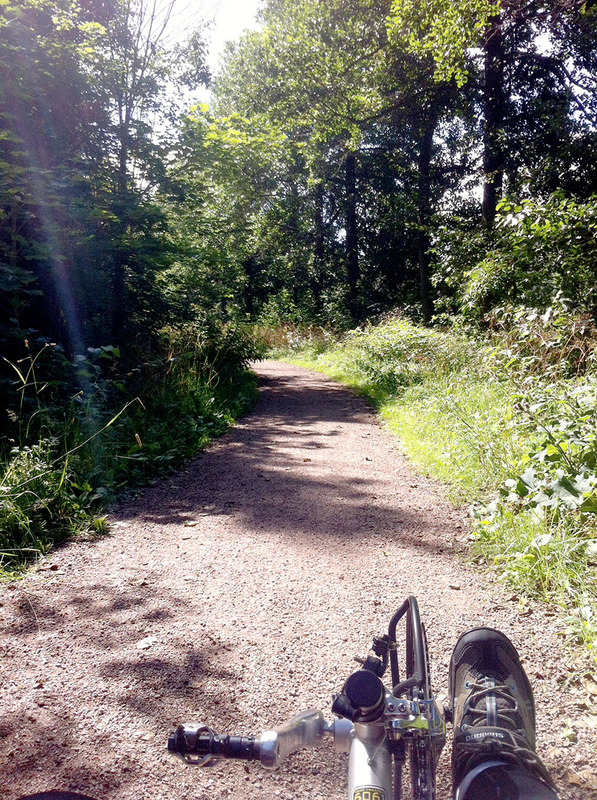 A lovely, shady gravel cycle path stretched before us. The river rushed and gurgled to the left and still, dark water in a man-made section of the Stromsholms Canal rippled on the right. It was quite crowded on the path. Barely a meter wide in some places, high weeds hemmed it in with drops either to canal or river just beyond the trees. Loke spent quite a bit of time in those weeds, his ears tilted back in the ‘irritated’ position as he kept trying to push the trike over. A family passed us. The boy simply watched us with eyes as wide as they would go. The woman, dressed in a silk blouse, linen skirt with hose and heels (an odd choice for what had become a warm day on a mosquito infested gravel path), stopped to ask about Loke as she stroked his head. She was surprised when I told her he was a husky. A lot of people seem to believe all huskies have blue eyes. Also, I think the fact Loke’s markings, a bit different from most symmetrically marked and often darker animals, causes some confusion as well. The little tongue of land widened at an open lock. Picnic tables sat near the water across the path from a white plastered building marked Trångfors Smedja (Trångfor’s Smithy). The smithy had been built into a slope which dropped steeply down to the river. More picnic tables sat down there as well. A wonderful place to take a short break, water-up Loke and take photos. Though I had no plans to move out of sight of the trike, I locked it all the same. Loke was in a frenzy of activity as the path was used a lot by people walking their dogs. While sitting at one of the tables after taking pictures, three canoes went by. As the people in them smiled and waved greetings, I had to wonder how much trouble they had getting the canoes in and out of the canal for portage. I’m not sure how operational all the locks are. The one they paddled through near where I sat looked as if it had been sealed in the open position. I decided to move on after Loke terrorized a timid little Sheltie. A woman walked by with three of them. Two were indifferent to Loke, but the other was cowering away as far as it could. I held him short, but Loke still gave a playful, ‘I want to say hi! !’ hop. That frightened little dog screamed as if kicked by someone wearing a steel-toed boot. I would have expected mangled limbs if I’d heard something like that in the distance. Loke never got closer than 10 feet. I felt terrible for it as most dogs only get that fear of others from a traumatic experience. Just a little down the path, I passed the canoes again, but this time they were on land. The six young men and women had pulled them out onto little trailers for portage. A swing had distracted them. They weren’t dropping into the water though, only taking turns to swing out over and back. It made me think back to the times I’d been around a few water swings in my late teens and early 20s. One went out over the water from a tree growing at the edge of a high bank. The drop at the furthest point from land into the dark water of the creek had to be 20 feet or more. I remember the guys all badgering and daring each other to make the drop as the rest of the girls giggled. I finally took the rope from the one who kept stalling. The guys laughed, saying I’d be back. I was… after swimming out of the creek and climbing back up, laughing at the stunned faces. After that of course, the guys had no problem going off the swing. How could they after a girl did it first? Whatever happened to that girl? Oh, yeah. Her knees, ankles and back got wrecked and she gained weight and 20 or so years. *sigh* Ah, crap. It just happened didn’t it? Time to play ‘Glory Days’ as I roll my eyes at myself. Just past the canoes, I heard the roar of water. The trees ended and a road with bridge came into the view. In the open area, a pair of locks stood with a cascade overflowing the top of the lower one. Of course, I stopped for a photo. Moving out again after the photo, I stopped within just a few yards. A woman had come walking up the path with a jämthund which is called Swedish Elkhound in English. Beautiful dogs. They belong to the same Spitz family as most northern breeds. They look a bit like huskies or probably more like Malamutes. They’ve got something of a husky’s grace and pointed ears, but muscled to bring moose and bears to bay until hunters can catch up to make the kill. The woman called out something, but I couldn’t hear her over the roar of the water. Politely, I got off the trike to converse with her. Loke stayed with the trike. Jämthunds aren’t crazy aggressive like the German Shepherd lines in Sweden seem to be, but their nature tends toward the dominant. It seemed best not to risk this one’s good temper to Loke’s boorish attempts at dominance. The woman asked if Loke was a husky and again my response was a surprise, though hers wasn’t based on the eyes. She thought Loke looked small for a male husky and said the last few of the breed she’d seen were wider through the forehead and had slightly smaller ears. Then she asked if he was one of those with one blue and one brown eye. I answered that one of his sisters (I think) had eyes like that, but Loke’s were brown. Her jämthund was female and she really wanted to go to Loke, but after establishing that Loke likes to think of himself as dominant and the jämthund knew she was dominant, it would be best to keep them apart. The woman laughed when I told her Loke used to make a habit of getting himself into trouble by trying to bully other dogs only to run to me to protect him when he ticked them off. Not an aggressive bone in his body. Unless it’s a bird, mouse or other small animal anyway. After about 20 minutes of talking, she wished me good journey and both of us went on. I left the cycle path there to head due west. Probably one of the few parts of the planned ride that went west rather than south, east, north or any combination of those three. There was a church a few miles away and somewhat off by itself from other things north of new E-18 and west of Västerås. If I took the time to ‘collect’ at that moment, it would save me headaches planning future tours. So, off I went to the west for an out and back. Less than half a mile from the canal, I found Åsby which seemed to be quite popular. It’s an old lantbruk area. Lantbruk I guess translates to roughly ‘agriculture works’. Not a farm precisely, but where the produce from farms is gathered and processed before being sent on to places like Västerås, Stockholm and beyond. The place has been preserved for cultural significance and had a lovely park-like area around a larger building which looked more modern. Cars were packed around it and some of the people who walked the path seemed to be going to it. A sign advertised the sale of wild and domestic meats and I think a restaurant was there as well. That didn’t hold my attention much, so I turned south. Not far along I found a pair of old buildings that did catch my attention. 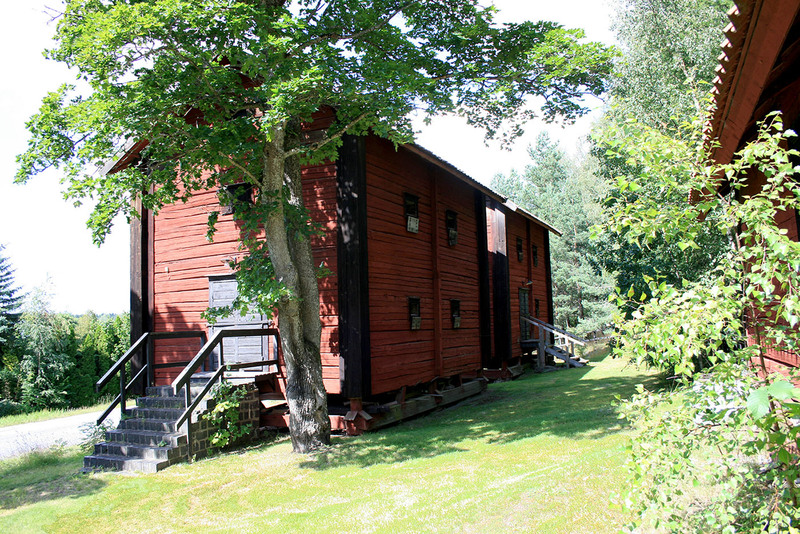 The two of them apparently housed part of the Åsby Lantbruk Museum. Of course, it was closed. Old buildings like this amaze me at times. Not just for their age, but the construction of them. These were large buildings and yet, they’re perched on logs and even stacked stones that look rather precarious. Yet they stood for centuries and people and goods moved in and out of them. The two structures are actually connected by a small catwalk in the space between the upper floors. I tried to get a good position and angle to frame that view, but alas, there simply was no space. I would have needed a lens with a much smaller focal length to accomplish it in the minimal space available. Lovely buildings though! I took a turn along a dirt road that seemed to lead to a parking lot. A sign forbid motorized vehicles, but not bikes. On the other side of it was another dirt road leading to a paved. The clouds had pulled back and the sun glared off the pale dusty surface of the unpaved track as we bumped along between farm buildings. Just across a field I could see the road which would lead me to the church, I just had to cut north for a few hundred yards before heading back south to it. Loke missed the clouds I think. I began to take things slower as it felt much warmer without the shelter they’d offered against the heat. I also made sure to stop frequently to offer water to the furball and wet down his ears. He still seemed impatient every time I stopped which I consider a good sign. A few bike riders passed me in both directions with cheerful waves and greetings. One woman slowed to say my bike was incredible and my dog beautiful before she went ahead. A little less than 2 miles down the road, I found the church. Berg Kyrka was a simple church, sharing it’s churchyard space with a typical bell tower of black stained wood. Collecting my camera and other electronics to take with me on a tour of the church grounds, a woman briskly approached me with a broad smile. It was the same who had paused to comment on Loke and the trike. She was very friendly and eager to talk. Our conversation stretched long enough that Loke gave up any hope of moving on soon and laid down between us for a nap. She asked how an American came to be living in Sweden and seemed amazed at my bravery to have simply picked up and moved to a foreign land. She had never lived farther than 15 miles or so from the place she was born. That led us to comparing notes between a life of constantly moving to a more sedentary one. After half an hour, she went back to tending the grave she had come to visit and I went to take a look at the church. Finding no runestones, I settled in for a bit of a rest on a neatly manicured grassy patch outside the stone wall. Loke drowsed in the grass. I stretched out on a blanket to review my maps, read a bit on my Kindle and nibble another packet of the Wasa hard bread/cracker things. When the furball started to stir and get impatient, I looked for a place to throw my wrapper. Wouldn’t you know it? I found a bathroom building behind a mausoleum. I didn’t really need it, but I took advantage of the facilities any way. I also topped off our water supplies. Loke and I had guzzled down about 2 liters. It also gave me a chance to soak down not only Loke’s ears but his legs too. He wasn’t terribly happy with that. During the pack up to leave, I found myself deprived of the blanket I’d been using to twist into a circular cushion to protect to my tailbone. I won’t go into details except to say, ‘ticks’. Lesson learned, stay off even beautifully manicured grass. At least I didn’t find any of them on me, but I wasn’t looking forward to riding without the buffer between my still painful tailbone and the trike seat. As we left, Loke and I had a minor conflict of wills. He wanted to run flat out. I wanted to keep him from being over heated less than a 100 yards from the church. Neither of us won really. We went slower, but he just pulled hard against the brake while giving me annoyed side glances and panting. It felt steadily warmer as we continued. At times we crept along at barely faster than an unhurried walk. The fact it didn’t bother Loke once we gone a mile from the church concerned me a little. Of course, then he’d give me a ‘look’ with a little hop into a faster stride as if chiding me. I know his fuzzy head doesn’t really work that way, but sometimes by his mannerisms I do have to wonder. Hallstahammar went by rather quickly. Nothing pulled me to stop and take photos. My map book’s description of the village/town offered nothing more interesting than the canal and Åsby Lantbruk which I’d already seen. So, it was mostly modern residential buildings, gas stations, shops and industrial structures as we coasted through on cycle paths along the streets. The route took us east, a bit closer to Västerås, before I turned us south toward the next church of the day. I didn’t spend long at Svedi Church. I guess the possible tick infestation at Berg had made me wary. Just the quick check for runestones and moved on. Not much info on this church either. Though two people of note (in Sweden at least) are buried here. It was about a mile after Svedvi Kyrka that events seemed swirl into a perfect storm of potential disasters. As if Murphy decided, ‘Okay, she’s had it too easy today’. It started innocently enough with deer. As we rounded a curve and came down a hill, the road split a pair of fields. On the left, the field had been fenced with about 6′ high wire mesh generally used to keep deer penned. The other side was plowed or maybe cut hay, I can’t remember which because at the bottom of the hill a pair of deer distracted me. One stood in the middle of the road, watching us as Loke’s weight slammed into his harness and he gave a little whine. The other looked up from picking its way across the ditch to the road. I cringed as Loke struggled to lead us into a 20+ mph charge after his perceived quarry. His socks. Pulling with that much force could strip them right off his feet no matter how tightly Velcro-ed. Struggling back up a hill in search of a doggie sock was not what I wanted. It was getting time to look for a camp site. I was tired, Loke (until he saw the deer) had been flagging. The deer panicked. The one in the ditch turned away from the fenced field immediately to run a little way back over the other field before dodging up a very steep, rocky and recently clear cut hill. The first one, took a few steps toward the fence before realizing it’s error and turned to the follow its companion. Even with my hands on the brakes, Loke managed to pull us into 15+ mph. The deer vanished though Loke still kept up the strain. As we swept up the opposing slope past where the deer had been, I glanced at the furry’s feet. One foot lacked a sock. With so short planning, I hadn’t time to make more than 5. If this was to be a tour, I wanted to make each sock last as long as possible. I had to go back. Muttering under my breath, I found a spot to turn into, got up to drag trailer and trike around. Loke tap danced impatiently as I sat back in the trike. As soon as I clipped in and turned the wheels sharply right, he yanked us into motion. An attempt to turn the trike left failed. The right parking break latch had snagged the edge of the mudguard. It happens sometimes and usually it’s just aggravating. Not this time. Not with Loke snared in the full throes of prey-drive. He pulled with all his might back toward the bottom of the ‘valley’ at right angles to the trike’s direction as I clenched the brake. Then I heard a terrible sound. Behind the crest of the hill we sat near the top of, trike and trailer straddling across the road, car tires on asphalt. I’m sure a lot of people know the feeling of fragmentation that happens when threat of dire physical harm looms. Part of me screams with fear or anger. Another part seems coldly calculating how best to extricate my hide in a single piece. Fortunately, it’s that chillingly detached part of me which often keeps control. Do I panic? Yes. Over little things. Job interviews, dealing with argumentative people. The worst one is getting a book published or going to London alone. I don’t recall reacting with blind panic over anything involving life and death though. So, survival instinct kicked in. Time seemed to slow. My ‘logic’ methodically kept control as I struggled to stop Loke so I could turn the wheels more sharply right to free the steering without flipping. After fact, it always strikes me funny the way I scream in such situations. Hands calm, not shaking, no feeling of panic, and yet I’m shrieking my lungs out. Rather than fear, I remember fury and frustration as I saw the roof of the car rise above the hilltop. Car breaks screeched. The bumper stopped about 2 yards away from us and I put my hands together in grateful thanks to the white faced woman behind the windshield. The sudden appearance of the car startled and distracted Loke. He stopped to stare which gave me the chance to free the handles. Enter the next annoyance. The steering bars choose that moment to loosen under the seat. They were crooked and wobbly, but I could still turn the trike left to get out of the shaken woman’s way before another car came. I could just see her getting hit from behind. The car passed us and we coasted down the hill where I was able to find the sock. I ran over to pick it up and the collapsed into the trike seat as the after reaction hit me. A man on a racing bike passed me at that moment and gave me worried greeting, but I waved I was alright and he went on. I shoved the sock back on Loke’s foot to move out. By that time, I was emotionally and physically drained. I couldn’t stop shaking. I had this impulse to stomp around, rip up and throw weeds (better than my hair) while screaming curses at Murphy and his twisted sense of humor. “Anything that can go wrong will.” Indeed. Do I believe in Murphy as a real entity? No, not really, but it feels good to have something to holler at when everything blows up in one’s face. Can’t bring myself to blame a higher power. As I dislike discussing anything that touches on religion or politics, let’s leave it at ‘I yell at mythical Murphy when too many things go wrong at once’. I limped my trike forward to a spot I could get it off the road, a widened patch of gravel and weeds between road and ditch. I had the phone in my hand, finger poised to call Jens for rescue. Muttering under my breath, I chunked the phone back into the pod bags and set about stripping off the seat and luggage rack. This was a tour, dammit. I needed to at least TRY to fix the trike. Loke sighed a lot as I fiddled with things. Quick and simple to fix, I dealt with the steering. Solving at least one problem would make me feel better. It did. Then I looked to the dreaded gears. At first glance, it appeared the derailleur was completely trashed. It was canted far back and stretched to it’s limit in spite of the slack in the cable. I poked and tugged on it. Tried dragging the chain through it. When it didn’t want to move, I saw the chain had moved off the lower cog and bent the frame around it. After about 15 minutes and many greasy fingers later, I saw the cause. My chain tube had slipped back and gotten dragged into the cog which jumped the chain. I managed to get everything back in the right spots, then tugged gear cable. Everything gave a snap. A good kind of snap like everything clicked into place. I propped the wheel up for a test. It worked! I had 27 smoothly working gears. 10 minutes later, Loke and I were on our way. Climbing past the scene of near destruction between car, flesh and trike, I was so ready to find a place to camp. I was tired and still a bit shaky. Loke was content to amble at my walking pace which is slow enough to make my husband completely bonkers when we stroll together. The carvings in this area were chiseled when the shore line of the lake was much closer. The hills around may have even been islands peeking out of the Baltic with what is now the Mälaren Lake part of the sea. They were made during the Bronze Age, sometime between 1800 to 500 B.C. I would have loved to see them, but for all I know, I looked right at some and saw only the rugged stone. The spot was pretty and would have made a decent camp. The grass wasn’t too high though thick over the ground which other than the boulders seemed fairly rock free. Sheltered from the wind which had blustered all day. It would have been crowded with my tent, Loke’s shelter, trike and trailer, but manageable. A bit closer to the road than I would like, but not a deal breaker on such a small quiet lane. But completely illegal, I was certain. Why? There was a house right across the street. Not just a house, but a breeder of American Eskimos and German Shepherds. The din! Even if the dogs couldn’t see Loke, I guess they could smell him or had been set off by the ones who could see him. Between that and the fact that less than 100 yards lay between the spot and the house, I reluctantly moved on. Loke must have used up the last of his verve in his prey frenzy, because we both dragged along. I didn’t feel too bad, but I let Loke set the pace. Not long after that, I had a very strange confrontation. A man stopped and yelled something out his car window. Tired, I didn’t hear him at first and, without thinking, said “What?” in English. “You wear a helmet!” he said, also in English if a bit brokenly. He looked irritated and asked if I spoke German, then Dutch and even French (each in appropriate language). When I shook my head for each of them, he went on in a rant which sounded like Dutch so I suppose he was an immigrant as I am. Still waving an angry hand out the window as if gesturing his aggravation and outrage, he drove on. I gave Loke a confused look. He wagged his tail and stood up, ready to walk on. After that, we joined with roads I’d ridden during my first successful tour. The one where Loke began limping with what might have been a snake bite. It was planned to the semi-familiar sight of Säby Church was not unexpected. Houses were clustered around too tightly for me to even think about camping near there. Less than half a mile south of Säby Church, I came to another turn and a choice. Left would take us east and was the mapped direction. Right, west toward Stromsholm Castle and semi-familiar ground. During my first tour of May last year, the grounds around there had been my first choice to camp. There had been a few acceptable spots, but a horse competition had nixed it. The castle was 3 miles away. It was closing in on 6 pm and I couldn’t quite remember how much day light I had left. I didn’t know how long it would take to find a place. I figured I needed at least half an hour decent light to put up the shelters. The 3 miles went slowly, but soon the sign for Stromsholm appeared. And a gravel parking lot that looked to be a set up area for the equestrian field across the road. That had possibilities. Loke flopped down as soon as the wheels quit turning. I paced around a bit. It looked okay to camp. A dense mat of grass covered a large section of the clearing. I didn’t like how it looked like it might have held puddles just recently, but a little more checking found less ‘bowl’ shaped area. The road was small with little traffic and I was over 100 feet away from it. I moved the trike closer to the grass and took off the trailer cover. 3 cars abruptly turned in and a large pack of very noisy teens bundled out about 50 feet away. They were loud and pulled out cans of beer. Ah lovely. It seemed the spot was the local gathering spot for the bored youth of Stromsholm. The drinking made me even wary. People do stupid things in the name of drunkenness. Suddenly, I didn’t want to camp there, wondering if I was going to wake up with nothing but the tent I slept in. I know it makes me sound like an old fart, but I didn’t like packs of noisy 16-20 year old partying people even when I WAS 16. I’m sure most of the kids were nice, even if loud and bored but bad past experiences had me rattled. Loke was too tired to continue. I called Jens. He tried to talk me down, but another car arrived adding to the noise and flow of drink. He decided I was just going to be miserable which is not what he wanted. So, he jumped in the car, no complaints. In the quiet half hour between the kids leaving and Jens arriving, Loke stirred enough to be oddly lovey. I don’t know if he was trying to tell me he didn’t like it there or he was just being unusually affectionate. I’d given him a big helping of food and all the water he wanted. But he climbed into my lap as much as he could while I sat in the trike. When that became uncomfortable, he laid down practically under it and would paw at my hand if I quit petting him. Very strange. While terribly disappointed, I was also relieved when Jens came. Yet another tour cut into a fully loaded day ride. I’m glad Jens still remains optimistic and encouraging because I’m starting to have doubts and even thoughts of selling all my camping gear. Oh, and Loke is off to the vet tomorrow (August 7). Probably impacted glands again. 3 months and this will be the third time. That equals a full 30 days of antibiotics. We need a better solution than sedation, cleaning and pills every few weeks. So, Niclas will likely give us a referral to a surgeon. Poor fuzzy.